Keiran McGeachie fires Bonnyrigg Rose into the lead. This weekend will see all six idlothian junior clubs compete in the second round of the Scottish Junior Cup. For fans, though, it will mean having to travel as all the clubs have away ties. 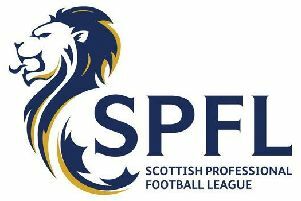 Bonnyrigg travel to Premier League side Fauldhouse while Penicuik travel to Ayrshire to compete against West Super League side Kilbirnie Ladeside. Midlothian’s other Super League side Newtongrange Star will travel up to Dundee where they will play against East Craigie. Premier League sides Arniston Rangers and Dalkeith Thistle are on their travels with Arnie heading to Central First Division side Wishaw while Thistle take on Lanark United. Easthouses Lily have the shortest journey of all as they take on Tranent. All club’s will hope the weather of recent does not hamper their ties as opposed to last weekend when nine East Region fixtures, two involving Midlothian clubs, were cancelled due to umplayable pitches. Going into last weekend’s league matches, Super League leaders would have wished their game had been called off as they lost three-nil to Lochee United at home. Third-placed Bonnyrigg were also at home last weekend and put in a ‘‘professional’’ performance to win two-nil against fourth-placed Dundonald Bluebell to maintain their unbeaten run this season. Newtonrange Star, who have seen an improvement in results in recent weeks, came back down with a bang at the weekend when they lost 5-2 to third bottom Kennoway Star Hearts. The only other local match was that of Dalkeith Thistle who drew 2-2 with St Andrews United. Both Arniston and Easthouses games were called off as was Lowland League’s Whitehill Welfare match against Creetown in the South Challenge Cup. If Welfare win their re-arranged second round tie, planned for November 11, they will face either Vale of Leithen or Upper Annandale in round three. This weekend Welfare are at home to Dalbeattie Star in the league, ko 2pm. The full Scottish Junior Cup second round draw is: Aberdeen East End v Blackburn United, Ardrossan v Dunbar United, Benburb v Craigroyston, Blantyre Vics v Lochgelly, Brechin Vics v Bo’ness, Broughty v Bathgate, Buchanhaven v Whitburn, Camelon v Hall Russell, Crossgates v Newburgh, Dufftown v Oakley, Dundee Violet v Forfar West End, Dundee East Craigie v Newtongrange Star, Fauldhouse v Bonnyrigg Rose, Forfar Albion v Haddington, Glasgow Perthshire v Kinnoull, Hermes v Blairgowrie, Hill o’ Beath v Buckie Rovers, Irvine Meadow v Broxburn, Kennoway v Clydebank, Lanark v Dalkeith Thistle, Lochee United vArmadale, Lochore v Spey Valley, Longside v Carnoustie, Lugar v Linlithgow, Maud v Harthill, Montrose Roselea v Coupar, Musselburgh v Darvel, Neilston v Dundee Downfield, Rossvale v Edinburgh United, Sauchie v Largs Thistle, Thorniewood v Dundonald, Thornton v Cumbernauld, Tranent v Easthouses Lily, Troon v Stoneyburn, Vale of Clyde v Arbroath Vics, West Calder v Scone, Whitletts v Jeanfield, Wishaw v Arniston.